The first thing that caught my attention when I looked throught the viewfinder was the reflection of the worker in the window. I tried to balance the picture putting the lader and the worker on the right and the window on the center. I saw this bike hanging from a fence when I was walking around Harvard. It immediately caught my attention. What an interesting way of "parking a bike." I coudn't resist taking a picture of it. Once I downloaded the picture in the computer I realized that by converting the picture to black and white and giving it a bit of an antique look, the bike would get more attention. Both the bike and the face were black and metal but also there were trees and buildings in the background that were distracting. These are some of our favorite pictures of a recent high school senior photo session we did in New Hampshire. Ally was great to work with. The location was amazing. We had a big variety of backgrounds to work with. I woyld love to do a photo-shoot there again any time. Yesterday I went for a walk around 1:30pm in Natick Center. And I brought my camera with a wide angle lens with me. I was surpriced to see no people walking around the Common. The last time I was there, was on a Saturday for the Farmers Market. It was full of people, kids and dogs. 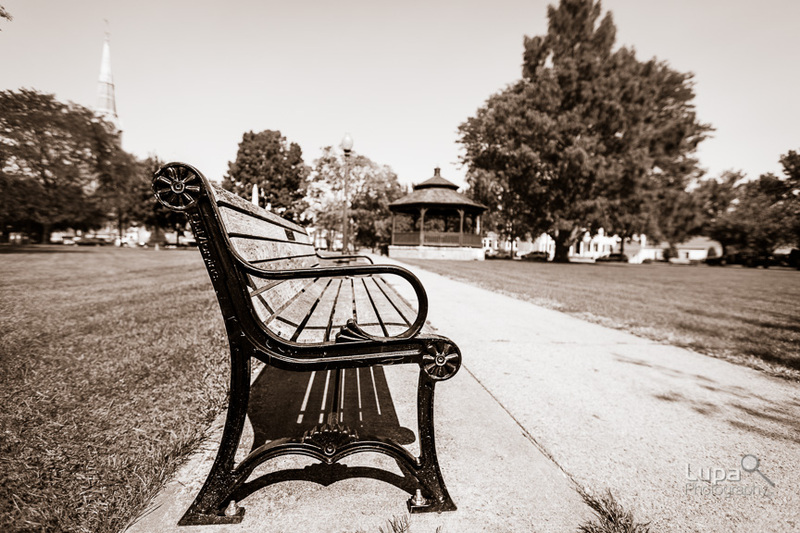 The focus on the empty bench on this picture is a reflection of the mood in the Common. When I was walking this morning after the rain, I found this tree that has been over taken by moss. Rain made its colors look very vibrant. Lines are very important in photography. In this case the tree is forming the letter Y. That led my eye through the entire photograph. When we do street photography our eyes are open to all elements in the surroundings. It is a process of searching for interesting subjects, personalities and attitudes; searching for stories to tell with photographs, looking on how light reflects in people and objects, etc.